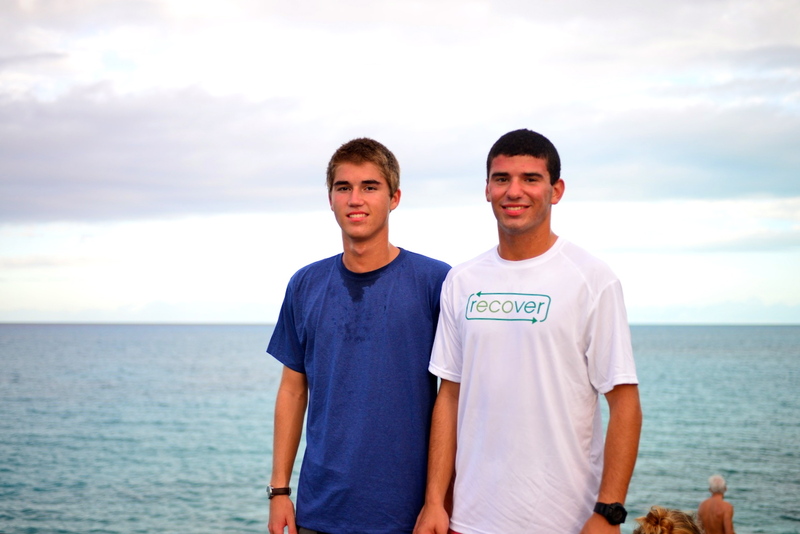 Ryan Schendel and Jake Varsano (F’12) put Recover Brand t-shirts to the test by wearing them during morning exercise. When we unveiled our updated Island School logo last fall, we also got to work on updating the Island School uniform to match. In fact, it was two Island School alumni who really got the ball rolling. During their Fall 2012 semester, Ryan Schendel and Jake Varsano decided to take on this daunting task as their Human Ecology final project. Determined to not only live, but also wear, The Island School’s mission to live well in a place, they began to contact vendors and test products. By the end of the Fall 2012 semester, they finally found their match in Recover Brands, a small eco-clothing start-up based out of Asheville, North Carolina that shares our same devotion to conserving the environment. We are excited to announce our partnership with Recover Brands, and introduce their products, made from 100% recycled apparel. We also continue to be proud of our students’ efforts to be leaders effecting change, especially once they leave The Island School. “Jake and I saw an opportunity to apply the sustainability factor of The Island School campus to the clothing we wear – this was a chance to take responsibility of the origins of our uniforms and campus clothes and recognize the impact our clothes had on the environment. I think the project was and will continue to be successful because now Island School students can be proud of the clothes they wear every day because they know the story, know their environmental footprint, and see a continuation of the campus sustainability from the moment they put their shirt on. If your wardrobe needs updating, or your old Island School t-shirt needs replacing, visit the new online store: http://www.recoverbrands.com/store/category/the-island-school. 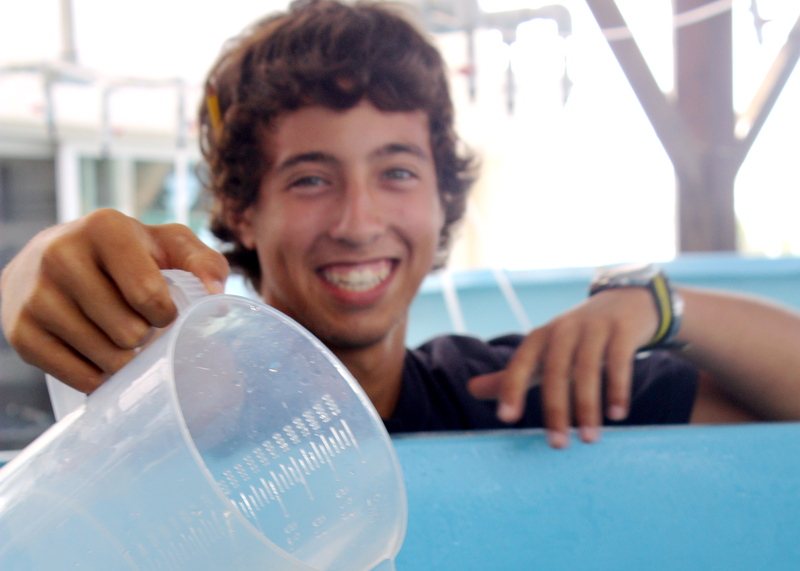 It is official, Gobies clean brood stock cobia! 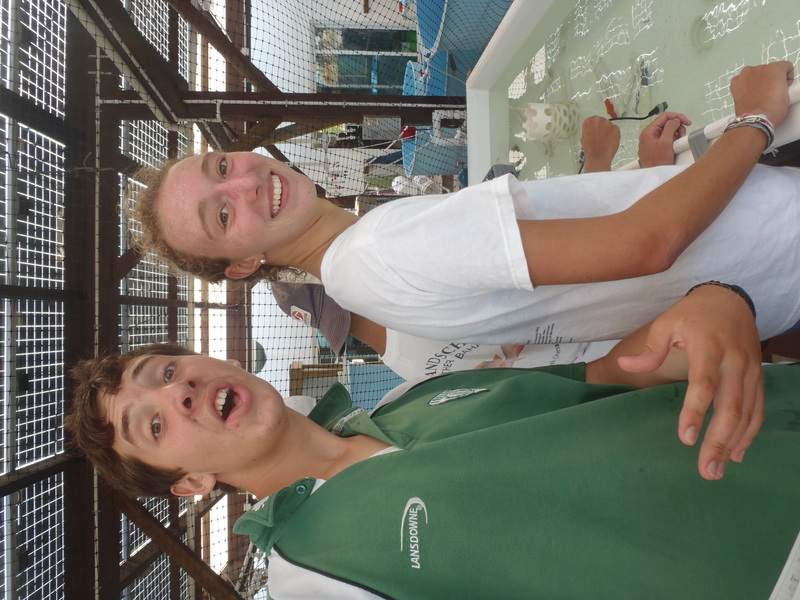 What an exciting Monday morning for aquaculture! We now have 3 goby breeding pairs that have all laid eggs this week. Our most recent pair needed to be separated from the two other resident gobies, so we decided to experiment. It has been relayed by word of mouth that gobies will clean parasites off the cobia. Nothing is ever that easy at CEI, so we needed to see it to believe it. Nine thirty this morning, Marie and I decided to take the leap of faith and place the 2 gobies into the brood stock cobia tank. No one knew what to expect. Would the gobies like their new home? Would the cobia know to stay still so the gobies could clean them? How long would it take until we would observe the gobies actually cleaning the cobia? Although we were down 3 scientist, Lea and Augie continued the research on the almighty sharknose goby. Earlier in the week we were on track to dive the cage, but despite Tyler’s heroic effort to save the day, we were without a boat. 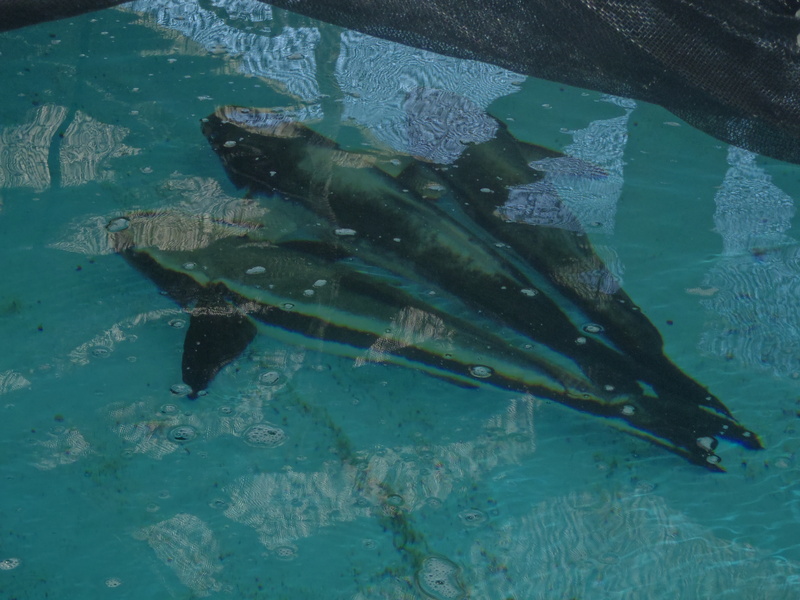 We recently received a small batch of 400,000 cobia eggs and spent all of Friday’s class separating out 8,500 cobia into a different tank. The gobies are living it up in the pairing tank while some of those sly sharknoses have found their mates, and have moved on to better, more private real estate. They all seem to be getting to know each other better and some on more levels than others. All the color of the gobies have seemingly returned so physically they are looking pretty too. We believe that the guys indoors have been doing better because of the much more pleasurable environment. Until next time, stay classy South Eleuthera! The much anticipated birth of 9 bouncing baby piglets happened this past Monday. The event created quite a stir, as folks around campus organized a pool that included date of birth and number of piglets. (The parameters were controversial, as it took considerable negotiating to work through the issue of live births vs. surviving piglets). But in the end, Spencer and Annie split for the correct date, and Tiffany, Alex, and Noel all predicted the correct number of live births. As master of all things farm and livestock on campus, Joseph was disappointed with his miscalculations. But he vowed, with a sunny optimism only Joseph can muster, not to be outdone next time!